God is speaking to you–today. Grow in assurance that he wants you to hear. It was really good. It was also one of those books that can’t be gulped down, because, well, it’s just *wrong* to slurp a book up in a couple of sittings when it talks so much about slowing down and spending time with God and listening for Him. That, by the way, is my big take-away from the book. I have a hard time slowing down and spending time listening for God’s voice. My imagination is so active that I have a hard time clearing it of activity to just be still, but that is something I’m working on. In the past I’ve prayer journaled a lot which really helps me to keep focus. Because of a wrist injury though, I haven’t done as much journaling or typing in the last few months, and so I’d been just praying instead of prayer journaling. Going back to prayer journaling (something this book encouraged), was helpful and I realized how much I’ve missed it. Mr. Goll’s writing style is quite practical and easy to understand. The way he talks about God was really encouraging. It’s obvious he views God with reverence, but also sees Him as a loving Friend and Father. In fact, he refers to God multiple times as “Papa God” which I really liked. Mr. Goll is personable in the book, sharing some of the things he struggled with, as well as times God worked through him. The book was easy-to-understand, challenging, practical, and a very worth-while read. Plus, the cover is beautiful, which is a plus. 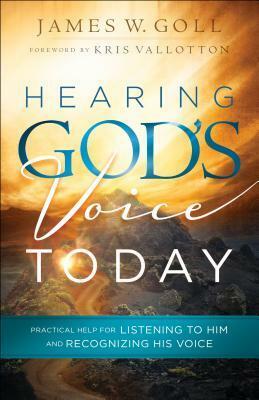 I’m giving Hearing God’s Voice Today 4 stars out of 5, and 8 stars out of 10. I happily recommend it.